People with dementia have been telling us for years that the most important thing in their lives are the relationships they have, and the sense of belonging……belonging in a family, a couple, a group of friends, a football club, or in a whole community. Since 2007 we have been working on projects that focus on the sense of belonging, and the right to belong. Much has been focused on belonging to communities, through our work on rights, accessibility and dementia friendly communities. More recently Damian’s work has enabled us to focus more closely on what happens within couples and support people through our work on Getting Along. 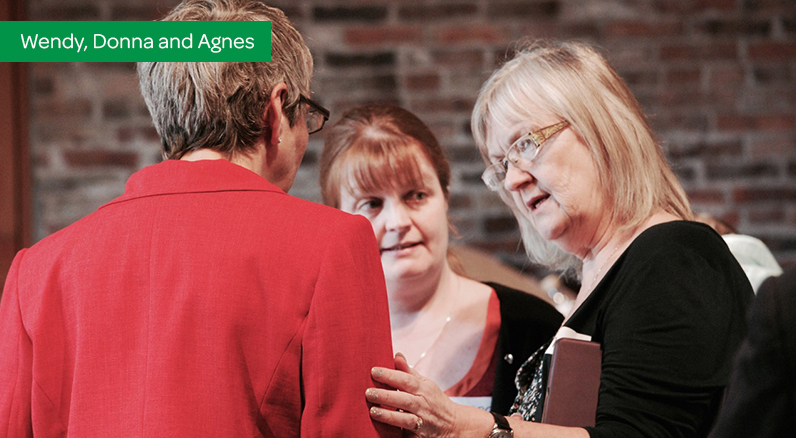 How can we harness the power and value of peer support for people living with dementia? We are starting to understand the power and value of peer support for people living with dementia. Peer support is routinely advocated in policy and strategies for dementia care across the UK – but access to opportunities varies and the waiting lists can be long. People with dementia are finding new ways of supporting each other through user-led influencing groups (see the DEEP website – www.dementiavoices.org.uk), blogging and social media. Getting Along is a ground-breaking approach in and around the time of diagnosis that helps couples and families to avoid the many traps that dementia sets within relationships. There are formal programmes for couples and families as well as training and facilitation courses for staff. ‘Was it all a sham?’ asked one man of his marriage of 40 years, struggling to understand his wife’s dementia. Far too often services have tended to separate carer and cared-for and treated each with their unique set of problems in isolation of each other. If you want to adopt a relationship-centred approach within your service or would like Innovations in Dementia to run a formal programme and training for you, contact damian@myid.org.uk for more information.